I worked on this Elven huntress character in conjunction with an orc character. She's meant to be a monster hunter of some kind potentially coming from a background of nobility. 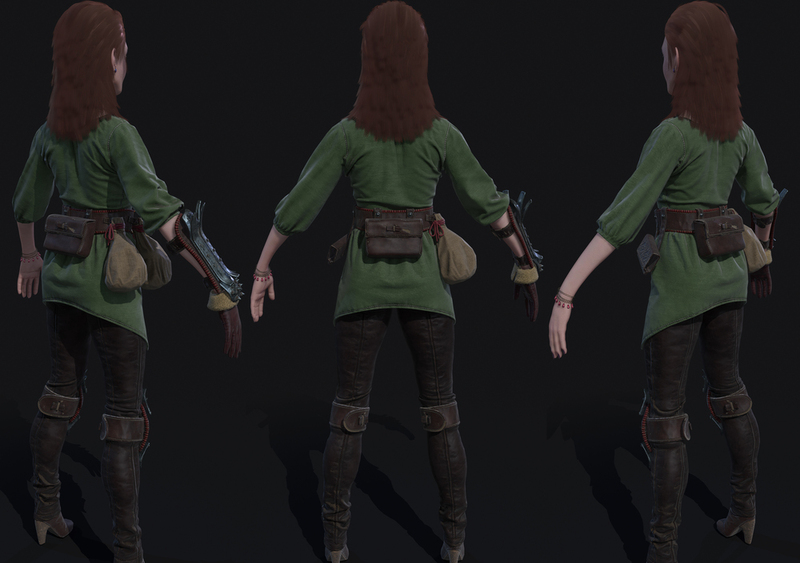 Marvelous Designer was used for base clothing folds and was then further detailed in Zbrush. I also used substance painter for base materials, with additional changes performed within Photoshop. All shots are realtime in Marmoset Toolbag 2. Work in progress shots of the face and hair. Texturingxyz displacement maps were used for high res skin details in conjunction with traditional sculpting techniques and alpha work. The head mesh is very dense at the moment, currently at 43,680 tris, I'm planning on optimizing it in certain areas. Sculpted detail using texturingxyz maps for fine details. Current polygon count for the clothing is 45,248 tri's. Base body anatomy, Still work in progress.